Certainly modern tools do a much better job of merging than in my youth. A good example of this power is merge-through-rename which can properly merge the situation where I change some of the contents of lorem.rb, while Jez changes its name to ipsum.rb. The simplest example is that of renaming a function. 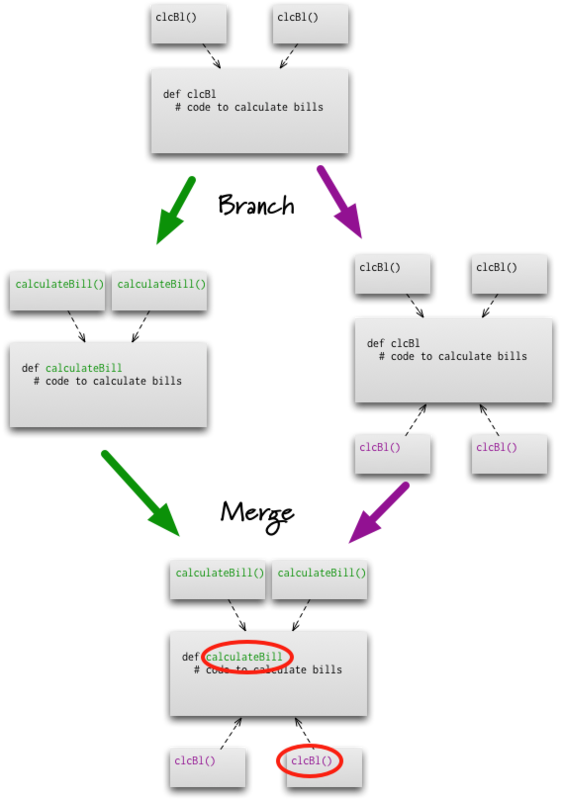 Say I think that the method clcBl would be easier to work with if it were called calculateBill. With modern refactoring tools this is trivial: just press Shift+F6, type the new name, and the tool then changes all the callers. The problem appears, however, if Jez adds more calls to this method on his feature branch. When the two get merged, the textual merge will work fine, but the program will not run the same way. A method rename is a simple example, and is also easy to find in a statically typed language as it will fail to compile. But there are plenty of subtler semantic conflicts that won't merge so cleanly. Let's imagine I'm looking at that calculateBill method and realize that as well as calculating the bill, it also sends off accounting entries to the accounting system. I don't like the side effect, so I pull it out into a separate notifyAccounting method. I can then find all the callers of calculateBill and add a call to notifyAccounting. But Jez doesn't know about that in his branch. So the first point here is that however powerful your tooling is, it will only protect you from textual conflicts . The particularly annoying point is that semantic conflicts are harder to spot and harder to fix. The other technique that helps is to merge more often. Jez's difficulties are much less if he discovers my change in a few hours rather than in a few days. That way he's no longer building a lot of code on the old semantics. This is why we are such big fans of continuous integration. There seem to be two groups of people who promote the notion of tools make feature branching tolerable. One is purveyors of "enterprise grade" VCSs. We don't really care about them. The other group is fans of DVCSs (Distributed Version Control Systems). I get a bit more concerned about the latter group. Often people try to justify DVCSs based on how they make feature branching easy. But that misses the issues of semantic conflicts . There are lots of good reasons to use a DVCS, so there's no reason to couple a good tool to a problematic technique. 1: And if we change the exact same text, the merge tool usually can't help either unless you have something like git rerere. But that problem is much smaller than semantic conflicts. 2: If your features are built quickly, within a couple of days, then you'll run into less semantic conflicts (and if less than a day, then it's in effect the same as CI). However we don't see such short feature branches very often.